Two teachers prominently feature cartoon romanticizing stabbing attacks on their social media pages. UN silent. Two UN-funded teachers are under fire on Monday, after they prominently featured a cartoon glorifying and romanticizing stabbings in their Facebook profiles. United Nations Relief and Works Agency (UNRWA) teachers Hiba M. Miari of Lebanon and Sawsan M. Nasser of Gaza made the cartoon their cover photos, Elder of Ziyon reports, amid an explosion of violence against Jews across Israel - which has been fueled largely, if not primarily, by Palestinian Arab incitement. Just last month, an expose by the UN Watch NGO revealed that teachers in UNRWA-run schools were posting graphic images encouraging anti-Semitic stereotypes and terrorist attacks against Jews, and even glorifying Nazism. 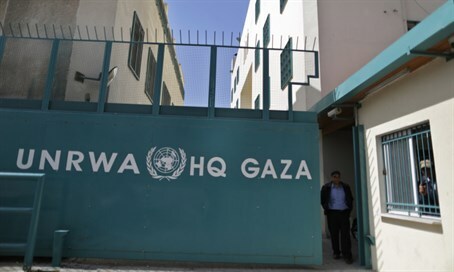 But despite a direct appeal to UN Secretary General Ban Ki-moon, the only response so far has been a slew of personal attacks by UNRWA's official spokesman Chris Gunness against UN Watch and its director, human rights campaigner Hillel Nueur.